Yes, the dynamic duo are back with more crazy than you can shake a crazy cat lady’s crazy stick at. Joined by three of the E-On crew they (eventually) decide to premiere the new season of Dragon’s Den with an actual episode. 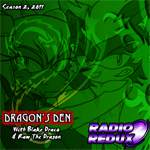 As such you’ll now find a Season 2 page in the drop down menu for Dragon’s Den, they’ve got new album artwork – though this might actually change down the line. Whatever the case it’s an hour of mischief with Blake and Ram as your hosts. And the Spanish will all become clear if you listen in. It’s a brand new year and what started as a regular skype party with TallGuy, Spin and T.A quickly mutated into a DD Show! But with E-On down and over 9 months of hiatus, how will Blake and Ram kick off the second season of this podcast? Randomly is the answer.